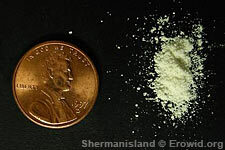 Methylone is a synthetic empathogen. It is relatively uncommon and has only a short history of human use. Methylone sold as "Explosion" and "Inpact"